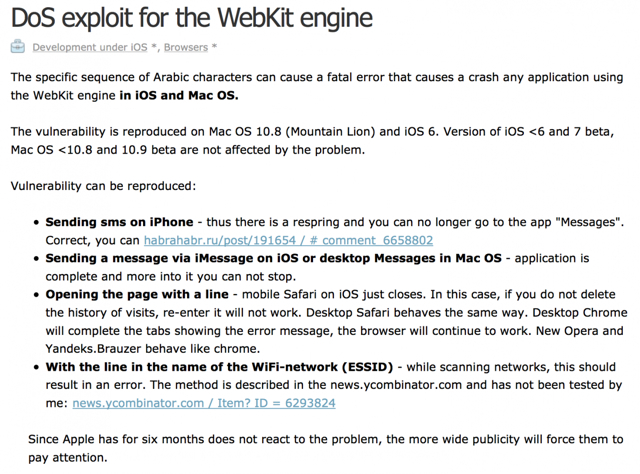 FilippoBiga has released GlyphPatch, a tweak to iOS that prevents a DoS attack which targets the WebKit engine and causes apps to crash when rendering a malicious sequence of characters. On Aug 29th, 2013, a DoS (Denial of Service) exploit targeting iOS / OS X was disclosed. This exploit is based on a vulnerability affecting iOS / OS X characters rendering engines: this tweak aims to patch that vulnerability in order to protect the user from this kind of attacks, since the exploit can be triggered through different surfaces (SMS, iMessage, web, network SSID). You can install GlyphPatch from the Big Boss Cydia Repository.